The United States system of democracy has faced few administrations as tumultuous as the first few months of rule under our 45th president, Donald Trump. Combine the chaotic nature of the cannabis industry with the chaotic nature of Congress, and a world of unknowns emerge. But as luck would have it, marijuana is more popular than pretty much any political figure in the country. While politicians are still moving at a snail’s pace to end federal prohibition, there is great hope for progress on a political issue that is approaching a watershed moment. This week, a number of amendments to appropriations bills will be discussed on Capitol Hill which relate directly to federal marijuana enforcement. Those amendments include protections for veterans using medical cannabis, supporting states’ rights to proceed with legal systems of cannabis production, and creating a provision to protect water rights for cannabis and hemp growers who are in compliance with state law. While activists have seen much movement forward in the past few years, there is no guarantee that things will continue in the same direction. “Whereas spending bills have in years past been brought to the floor under rules that allow votes on almost any germane amendment, House Republicans last year began locking down the process after controversy surrounding riders concerning gun policy and the right of transgender people to access public bathrooms threatened the passage of some bills…. “As MassRoots first reported last month, Sessions recently asked Congressional leadership to delete the appropriations rider protecting local medical marijuana laws. If the Senate committee votes to renew the provision, especially if via a strong bipartisan vote similar to last year’s, it will be considered a strong rebuke to the attorney general. While the future is unknown, the cannabis industry is here to stay. Getting good information on cannabis laws can be daunting In today’s world of rapidly changing political headlines. 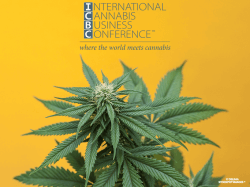 There’s no place to be better informed on how to stay ahead of the game than The International Cannabis Business Conference. This December 1st-4th, 2017, in Kauai, Hawaii, expert panelists will speak to the most current in cannabis developments, including The Legal Landscape and Recreational Sales Under the Trump Administration. Get your tickets today!